Yang Zhi Chao is from an Yi minority family of tea farmers in Man Zhaun. I met him through his nephew whose family still live and produce tea in Man Zhuan. He came to work in a Jinghong tea factory in 2008 which had been set up by a civil engineering company from Kunming. Their tea was never commercially available, being gifted by the company to clients, etc. Yang’s job was to work sourcing and making teas. He still has some of their tea in his shop. Hiding in this rather ordinary looking shop in the Jing Sha Tan area near the river in Jinghong are a couple of little gems . He likes tea from Man Zhuan, Mang Zhi, Ge Deng and You Le, but also likes some Menghai tea – particularly some Bulang Shan teas. 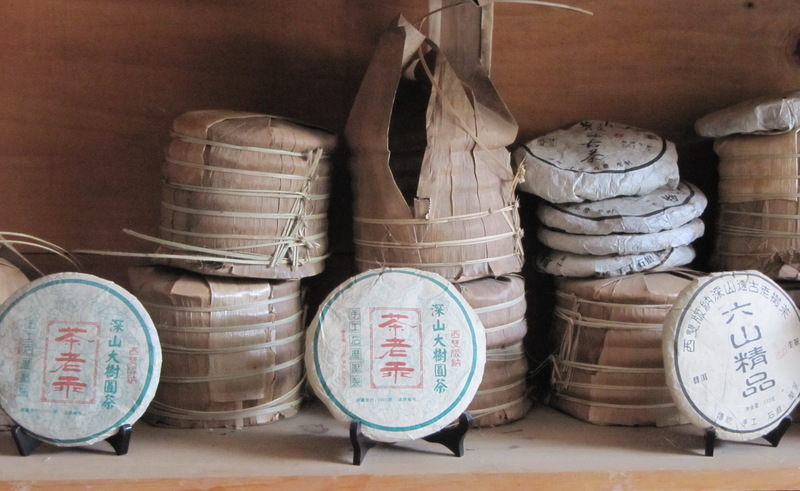 Bo He Tang is one of the favourite teas that he has sourced over the last two years – both spring and autumn – which he will make again this autumn, along with Ge Deng, Mang Zhi, etc. He still makes some of the tea himself, but also works with friends and relatives to source teas from other parts of the Six Famous Tea Mountains.